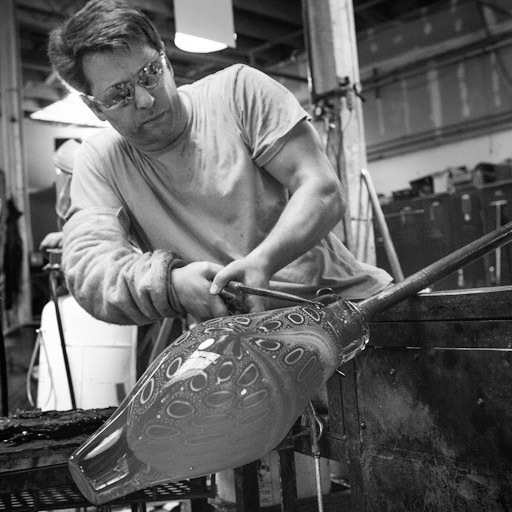 See guest artist David Patchen in live, narrated demonstrations in the Amphitheater Hot Shop on May 24 from 10 am to 12 pm and 1 to 4 pm and again on May 25 from 10 am to 12 pm. Then, come back on the 25 from 6 to 8 pm as Patchen takes the floor for 2300°. David Patchen took a glassmaking class in 2001 which would inspire a drastic career change and permanently alter his life’s direction. Transitioning out of the corporate marketing world and into the life of a professional artist, Patchen has now been working with glass for over two decades. His work is known for its intense colors, intricate details, and meticulous craftsmanship. Born and raised in New York, David Patchen took a glassblowing class in 2001 and was so inspired that he transitioned from a professional career in marketing to a full-time glass artist. Patchen has studied at the Pilchuck Glass School, where he won an artistic merit scholarship, and served as artist-in-residence at Seto City, Japan.